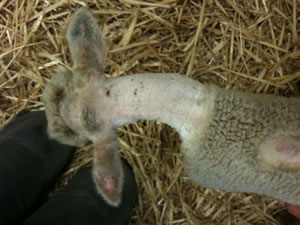 I used the 2400XL laser today to treat this 3 month old lamb who was attacked by a dog. She has had laterally flexed neck with muscle spasm (torticollis) and bite wounds for 5 days. I treated her with the laser and manual therapy – she was then able to position her neck in a neutral position and she fell comfortably asleep. I used the HPLP (500mW probe) at F4, 2J/cm2 on 6 points on each side of her cervical spine for a total of 12 points. I stayed on the dorsal and lateral aspects of her cervical spine. I also did some lymphatic drainage massage, reciprocal muscle inhibition techniques and passive positioning. The photos I sent were taken after the first 20-30 minutes. The one with her on the fleece was at 45 minutes. Many of my treatments are with inpatients for just one or two days and then the animals are discharged to home. I was pleased to see immediate results today with the lamb, as did the faculty and students.